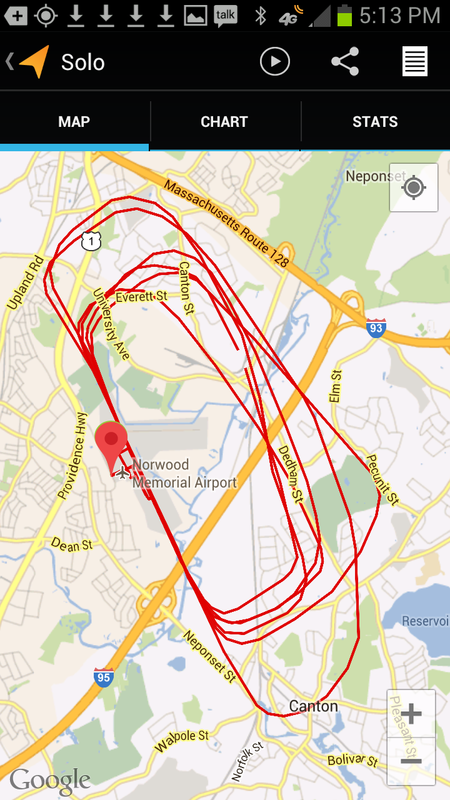 The next two landings went surprisingly well too despite lateral gusts on the approach throwing me off. My instructor commended me on my handling those and instead of backing off became even more convinced that I was ready. He had me stop after the fourth and got off the plane to go to the tower and see if I could fly. All this happened way to fast for me to digest and here I was sitting in a plane all by myself. I had forgotten how to switch to ATIS to get the weather info as I had n0t been flying this non Garmin version plane. I thought I would just wing it and hope for the best that the Norwood Ground would correct me. I made the call in a rushed voice ” Norwood Tower, Warrior 244 November Delta, South Building, ready to taxi with Victor”. I should have said Whiskey but for some reason the Tower went easy on me and asked me to proceed to 35 via Delta and Alpha taxi ways. 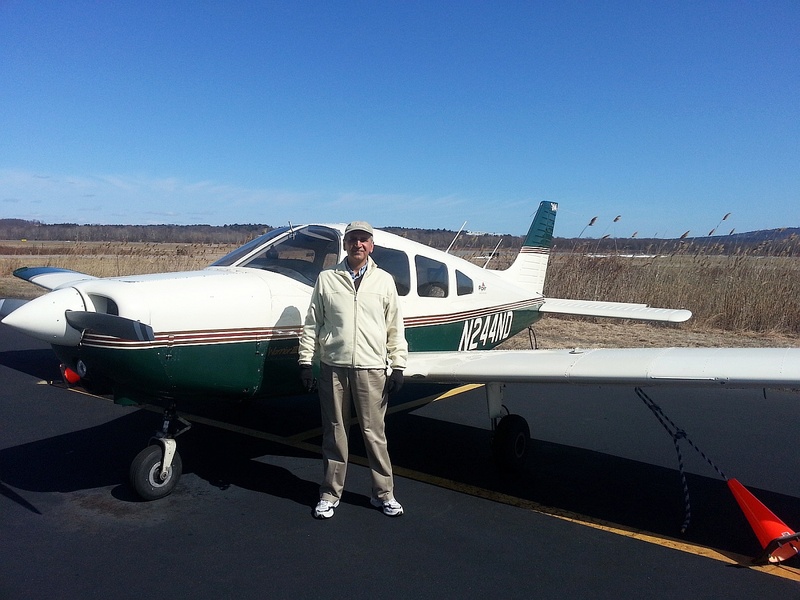 Luckily there were no planes on the ground and I had my instructor in the tower as well. As I taxied I thankfully remembered how to switch the radio to the Tower frequency. My instructor had told me not to go through the engine run-up since we had done that earlier. So I went ahead and stopped short of the lines that indicate the place to stop prior to take off. By now the tower was aware of a novice pilot that was about to hurtle the plane down the runway alone for the very first time and I could sense the friendly tone in the controller’s voice. The plane took off very smoothly and because of the stiff head wind the plane climbed very rapidly and I was at the 800 ft mark in no time. I did not even have to call the tower at midfield and the tower cleared me to for the option, as it is called in the aviation speak, meaning touch and go or a full stop. Even though I was prepared for the turbulence at the approach I was trying to maintain the speed and fight the cross winds that were picking up. I touched down my left wheel first and went back and forth a couple of times before settling down. In my rush to get the plane off the ground I did not raise the flaps all the way and as a result I had to fight the aircraft from getting airborne too soon. I realized my mistake till I had made the first turn and felt pretty stupid. But by then I had calmed down and gotten used to the empty seat next to me. I think I made the most relaxed call to the tower when reporting that I was midfield and ready for the option. The second landing was the smoothest of the three that were required to be made and I climbed smoothly afterwards missing a couple of black birds on the way up. On the first turn I saw the Boston skyline at the distance with the Bay shimmering behind it. And for just a second felt like flying towards it before reality settled me back to the task of landing the plane for the final time. When I made the final call for clearance for landing I was told to look for a plane ahead of me landing ahead of me. I told the tower that the traffic was in sight. But for some reason the plane was landing at the wrong runway and landing in a very vertical approach. For a moment it seemed that I had been cleared for the wrong runway. But just then I saw another plane on the approach on the correct runway and realized that what I had seen first was a helicopter making a landing on the other runway. By the time I realized this I had started making a turn too early and decided to abort the turn and carry on longer to create more space between the planes. Which is why the last track shown in the figure below extends a lot further and is not quite rectangular. I am not sure whether it was a case of nerves or that the winds had started to gust a lot stronger or that I had prolonged the approach, but the net result was that I was being buffeted around quite a bit. 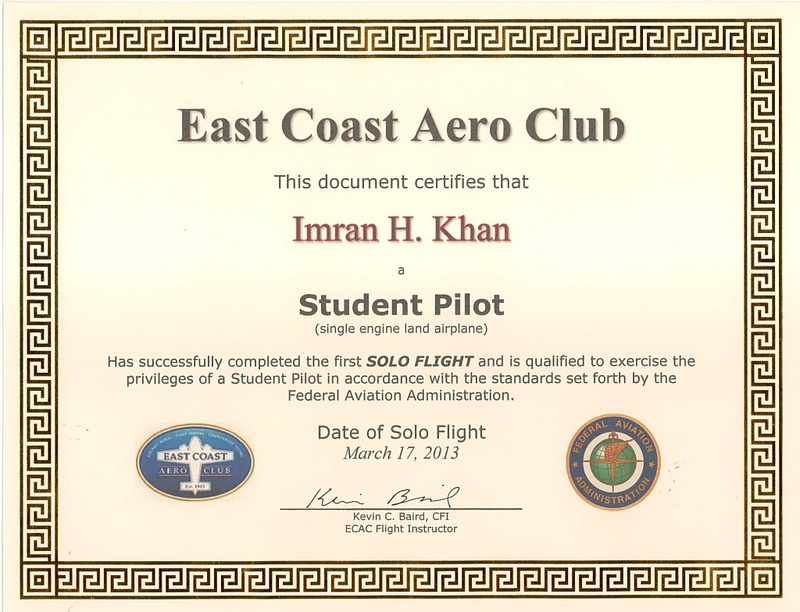 My first instructor had taught me to come in a bit high in those conditions and so I kept the plane higher than usual in the finals. As I came down the winds subsided a bit and I made a smooth flare close the center line and was super pleased till a gust pushed the plane down and I hit the ground hard enough to bounce quite high. Not having experienced anything quite like it, I tried to correct it. In the process I exaggerated the porpoising the plane for an unending period. At one point it seems that my prop might hit the ground but thankfully it eventually stopped and all three wheels were firmly on the ground. I am sure the Tower must have heaved a sigh of relief seeing me on terra-firma and crisply told me the taxi ways to follow to the parking lot. 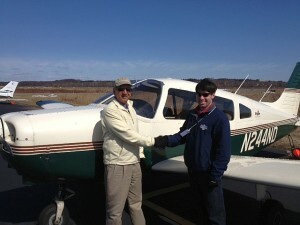 Taxing back is when it finally sunk in that I had completed my first solo. In the end I would like to thank my instructors Cliff Lanyi and Kevin Baird for teaching me the skills necessary for this to happen. As well as the East Coast Aero club of Norwood. Wow! !Imran, this is a great accomplishment. I am so glad that you did not suffer a heart attack. this makes for exciting reading…so happy you’re alive. I bet the tower guys are happy too! Congratulations, this is a large feat! Congratulations and welcome to the PIC community! Imran, the very best of congratulations on this very special occasion in your life. This is one you can never forget. I know how much learning to fly has meant to you. Coincidentally, Norwood is an airport I know fairly well having had all my 6 helicopter hours here spread over two years. it was fun flying with u on the empty seat, felt so while reading your narrative,i have interest in avaition, history ect ect,i am a senior citizen,(rtd), oil gas professional,use to fly in bell 212, and jet ranger 204, sitting in the co pilots seat ,and usually while flying dubai abu dhabi- karachi, use to enjoy the flight management, sitting on the jump seat behind in between pilot co pilot seat., talking to them with coffee sweets chocklates served in the cockpit. regards, enjoyed reading. , all the best.